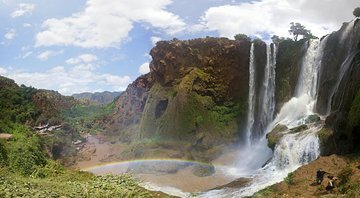 Check out the Ouzoud Waterfalls in Morocco’s Atlas Mountains on this day trip from Marrakech. Take a walk through olive groves and listen to the roar of the river as it falls 300 feet into several cascades that make up big and little drops. The juxtaposition of the flourishing waterfalls in a stark landscape creates a impressive form of natural beauty that shouldn’t be missed. Very nice and comfortable car. I was a bit disappointed that the actual tour at the waterfall was not included when the price was 50. The tour was 50 MAD and the lunch was 100 MAD, so fairly insignificant sums to add on, but this could have been included in the original price. Perhaps we were sold a different tour to the other reviewers. We were told that we had only paid for transport and nothing else, -! when asked what our tour included the guide got very aggressive, yelling and waving his hands, he was the guide with the braces. My friend was so scared she started crying. There were no optional gratuities, You were forced to pay 20-30dhs at every stop. The tour wasn't very detailed either, I think he only stopped to talk 3 or 4 times in the 3 hours, and only for a Minute or 2 each time. So basically this tour is falsely advertised as a tour, book through your hotel or riad and do not book online, it was such a waste of money. The guide also kept grabbing and kissing the small children on the tour, it made me so uncomfortable, another traveller mentioned to me that she felt uncomfortable too. If they were my children I would have absolutely lost my temper. A truly delightful experience. The drive from Marrakech might be too long for some people. but the guides know what they are doing and getting the ability to swim in the waters in the hot sun was a highlight. Excellent!! This was an awesome experience. I am so glad I booked through Viator. The tour guide was polite, friendly, funny and well knowledged. He also spoke multiple languages enabling the whole group to enjoy the experience. Without a tour guide you would only get to see the Ouzoud falls which is pretty impressive. However, with the tour guide you get a walking tour I wouldn't recommend wearing sandals down the river, learning about the history of the village and the bir bir inhabitants, then through the village, then descending down the breathtaking hillside, revealing spectacular views. An excellent day trip from Marrakech. Our guide Samir was great. The restaurant where we stopped for lunch had a great view, and the food was very good and not too expensive.